Win a new school building competition â€“ vote for the winner! Voting is now open in the TES and Clearspace Buildings competition to win a new school building worth Â£80,000. TES members will decide which of the six finalists will win, so make sure you cast your vote before 14th February 2013. "Bringing our community together to open up a world of opportunities." "We need a classroom, we'll tell you why, please don't let our pre-school die." "The kids have SAID we need a new SHED!" You will need to be logged in to TES to vote. If youâ€™re not already a TES member, you can join for free here. If youâ€™re not already a TES member, you can join for free here. Need extra teaching space? TES and Clearspace Buildings are giving away a school building. The winning school will get to pick the design and layout of their modern wooden building, which will then be constructed on their site during the 2013 Easter holiday. This stylish permanent building clad in red Cedarwood can be used as one large classroom, a smaller one with an annex, or as a studio space. 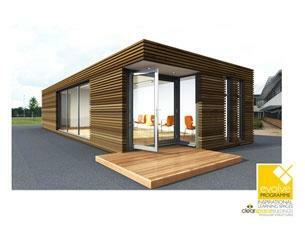 The buildings are part of Clearspace Buildingsâ€™ Evolve Programme, designed to create inspirational classroom spaces. In addition, Clearspace Buildings will arrange all the planning permissions, construction and finishing touches. For more information please check out the Evolve Programme on the Clearspace Buildings website.